I was assigned the blog Fantastical Sharing Of Recipes, which is full of delicious comfort-food + family-friendly recipes. There were SO many amazing recipes to choose from (pastas + crock-pot meals + sweets, oh my!) but in the end, I decided on trying these Snickerdoodle Muffins. So, how did they turn out? Absolutely wonderful. They have a perfect, buttery coffeecake-like flavor + texture, with just the right balance of sweetness + spice. They were so addictive that after eating two, I sent the rest to work with my husband – I knew I couldn’t be trusted to contain myself with those sitting in the house! 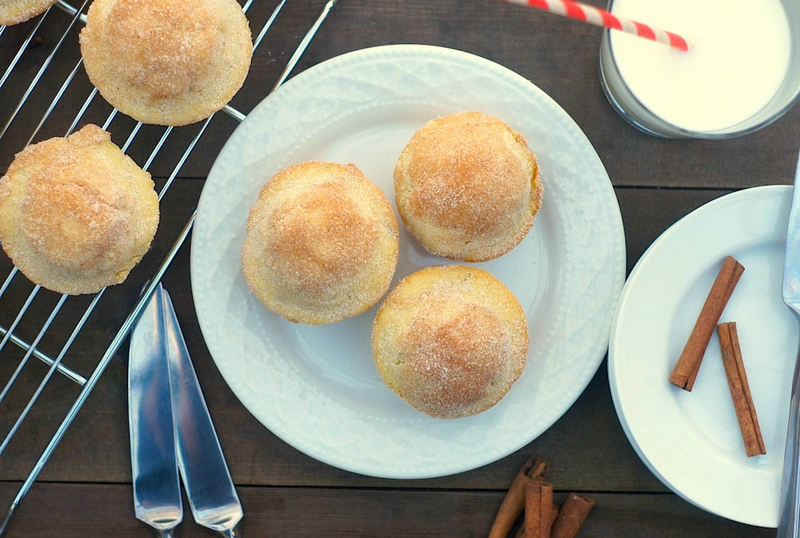 Thank you to Sarah for introducing me to these super scrumptious Snickerdoodle Muffins + to the Secret Recipe Club for connecting me, yet again, with fantastic bloggers + amazing recipes! 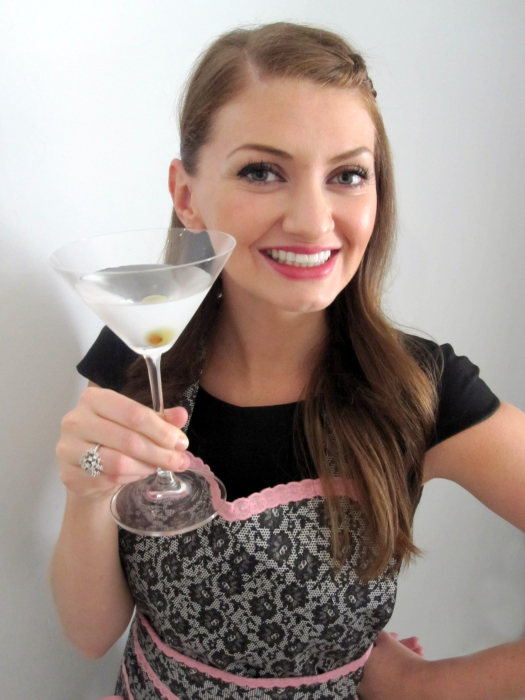 For all my previous Secret Recipe Club recipes, click here – there are TONS of awesome ones! Line a standard muffin tin with paper muffin cups, or grease the tin well. Set aside. In a medium bowl, or in the bowl of a stand mixer fitted with the paddle blade, beat together the egg, milk, melted butter, and vanilla extract. In a separate bowl, whisk together flour, sugar, baking powder, salt, and nutmeg. Add the dry ingredients to the wet ingredients in two additions, mixing only until combined – do not overmix. Divide muffin batter equally between the 12 muffin cups – they each will be about 2/3 full with muffin batter. Bake for 20-25 minutes, until a toothpick inserted into the center of a muffin comes out clean. Allow to cool about 15 minutes in the muffin tin, then transfer to a wire rack to cool fully. Once completely cooled, coat with the cinnamon-sugar mixture. First, combine the sugar, cinnamon + nutmeg in a small bowl. Have the melted butter in a separate small bowl. Dip the top of each cooled muffin in the melted butter, then roll in the cinnamon-sugar mixture. Serve at room temperature, or slightly warmed in the microwave or warm oven. Muffins will keep at room temperature for about 5 days in an airtight container. The muffins look so pretty and tempting. 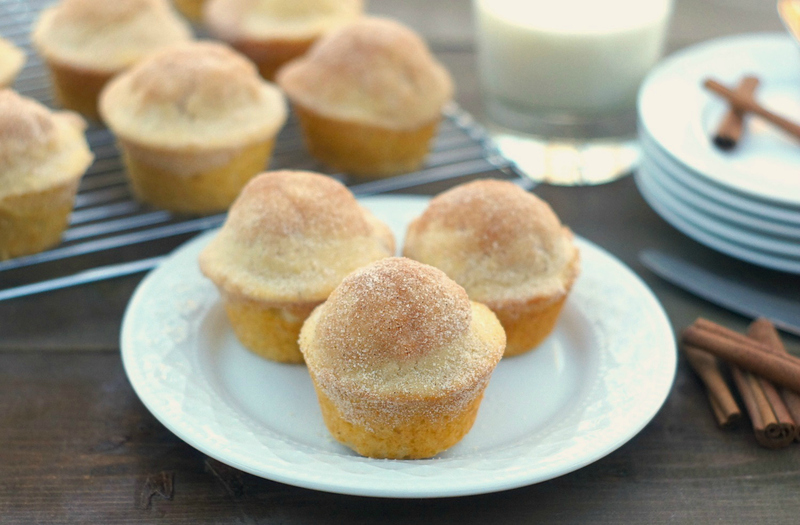 I love cinnamon and I am sure going to love these snickerdoodle muffins. What a lovely recipe! I don’t think I’d be able to trust myself with those muffins either! I love the cookie, so I can only imagine how awesome the muffin is! Yum! snickerdoodles are my favorite type of cookie, so these muffins are calling my name real loud! great choice for the first Reveal of 2014! Those look so GOOD!! I have a similar recipe and they disappear FAST whenever baked up as a tasty treat. Makes me want to pop a batch in the oven when I get home. Yummy!! Oh yummy! I’d love two or twelve of these with some coffee! Glad you all enjoyed them – they are so addictive! Beautiful photos for one of our favorite breakfast recipes. Great SRC pick this month! Oh yummy! These look fantastic! they look amazing..beautiful photos! Happy Reveal Day! Those are adorable! I can’t wait to try them! One of the best muffins to whip up last minute when you need something tasty to bring to a meeting, friends house or other. One can never go wrong with snickerdoodle flavor. Oh, those look beautiful. Give me one and a nice cup of tea, and I’d be set. I adore Snickerdoodles, so I know I’d love these! These would be a perfect breakfast or snack, I love muffins like that! Beautiful photos! These would be perfect for breakfast. These Muffins look so adorable!! Since they are muffins, you are telling me I can have snickerdoodles for breakfast. And I like it. How could I turn down a muffin that tastes like snickerdoodles?! So good! I happen to adore snickerdoodles in the form of a muffin. It just makes sense. These look amazing. Snickerdoodle flavor is one of my favorites, so I like it in any shape or form. I can’t wait to try these muffins! Ah yes, what a perfect muffin! I just love a good snickerdoodle cookie so why not make it into a muffin! Brilliant!!! Fabulous SRC pick! A cookie turned into breakfast. I will take it for sure. i love simple muffins like these! perfect choice. These look fantastic. I’m pinning them right now to make. I love snickerdoodle cookies, and I know I’d love, love, love these muffins. GREAT SRC pick this month! I love checking out your recipes Amy, they’re always so appetizing looking. I love snickerdoodle cookies, so I can imagine how amazing these muffins are. Great job this month! i love snickerdoodles. looks delish! You’ve made my favorite cookie even better. Thank you for sharing! I’m going to make muffins now! enpecialy the cinnamon sugar topping!!! These looks amazing. I think I remember when you instagrammed these…I literally almost died. I’d totally use these for a weekend brunch spread. Bookmarked for the next time I have guests coming over! How gorgeous are these? They wouldn’t last long in my house. Great post! Yum. I love snickerdoodles! I bet these would be amazing. Ooh la la! I need to make these muffins ASAP! Great choice for SRC. Oh, yum yum yum! Those look divine! The secret recipe club sounds like so much fun!! These muffins look amazing – what a great discovery! These turned out great. What a fun breakfast treat! So glad you liked ’em, Lucy! They’re one of my favorites (and so easy to make), too!